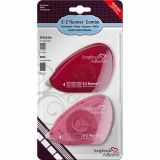 Scrapbook Adhesives E-Z Runner & Squares Dispensers - 3L CORP-E-Z Dispensers: 2pk. This package contains one of each: E-Z Runner and E-Z Squares. These are both acid free and archival safe. Runner disposable dispenser contains 28 feet of 3/8x1/16in pre-cut tape strips for perfect control: it allows you to apply adhesive in curves and circles. E-Z squares disposable dispenser contains 650 1/3x5/16in adhesive squares: apply these squares exactly where you want them. Imported.